You’re invited to Little Gems, a Small Works Fundraiser! Little Gems is a lively and fun way for ticket holders to own a small work of fine art or craft made and generously donated by our professional artisans. Cape Breton Centre for Craft & Design will be hosting this exciting event again on Friday, May 26, 2017, from 6:30 pm – 9:00 pm. The game of Little Gems is played like a draw or lottery, where every ticket holder is guaranteed to win. Each artisan is asked for a submission of three small works created for the event each equivalent to the value of the ticket price. The works will be on display in our third floor exhibit space on the night of the event and ticket holders will have a chance to preview them for 30 minutes before the lottery begins, allowing them to make note of their favourites. All tickets are numbered and once the event commences, tickets will be drawn one at a time and at random. The individual who holds the ticket number drawn will have a limited time to make their selection from the exhibited work. With the help of an assistant, the work is removed from its spot, given to the ticket holder and the next number is drawn. The excitement builds as works are won and the choices continue to change! Tickets are $50, which includes a piece of pizza and ‘liquid art’. Get your tickets online at littlegems2017.eventbrite.ca, phone 902 539 7491 or drop into the Centre in-person. 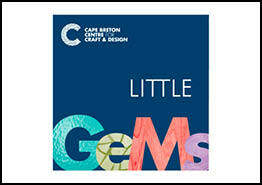 Visit our Facebook page, Cape Breton Centre for Craft & Design, Twitter and Instagram page, @CapeBretonCraft, for Little Gems updates.